Navaneeth has been in healthcare technology for more than 16 years, working across a gamut of areas focused on patient experience and access with the largest healthcare payers and providers including Aetna, Anthem, Ascension, MD Anderson, and others. For the last five years, he has been focused on the application of AI to engage patients in their health and amplify business process improvements. 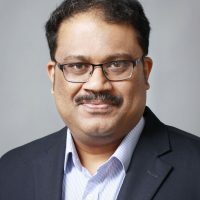 Navaneeth earned his Bachelor of Engineering degree from the University of Pune and his MBA in International Business, Management from The University of Connecticut School of Business.